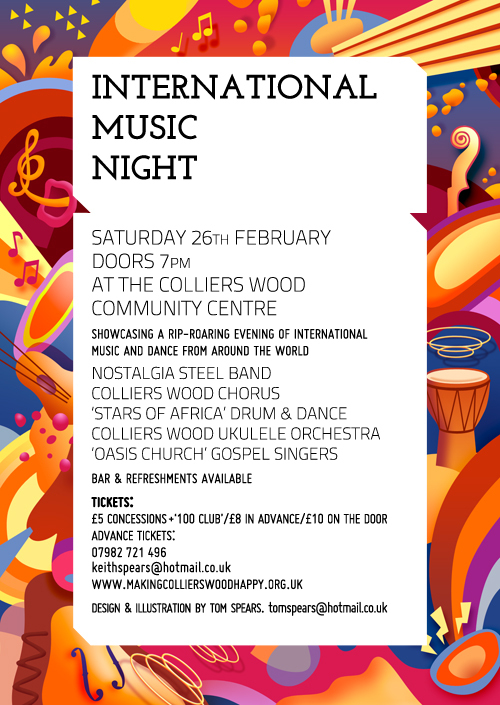 Celebrating the musical traditions of the diverse cultural groups who live in Colliers Wood. 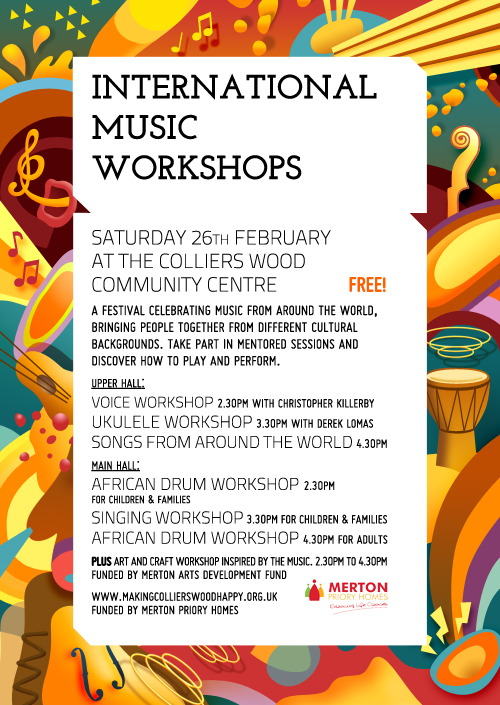 Free workshops from 2.30 p.m. to 5.30 p.m. including singing for adults and children and performances of music from around the world. From 7.30 p.m. on Saturday 26th February @ the Community Centre. For further details contact Keith on 07982 721496 or email keithaspears@hotmail.com. Funded by Merton Priory Homes. There will be an arts and craft workshop led by an artist from ACAVA and inspired by the dancers and costumes; from 2.30 p.m. to 4.30 p.m. on Saturday 26th February at the Community Centre. Contact Keith to book a place. Funded by Merton's Art Development Fund. From 5.30 to 6.30 p.m. on Tuesday 1st February at the library. Meet at the Colliers Tup at 2.30 p.m. on Saturday 12th February for a guided walk around Wandle Park, and completion of the audio guide to the park at St Joseph's Hall from 3.30 p.m. to 5.30 p.m.
Meet outside the library at 10 a.m. on Sunday 13th February for a ramble along the towpath from Kingston to Ham. Every Sunday from 2.30 p.m. to 4.30 p.m. @ the Community Centre. Contact Chubby on 07702 634359 or Keith on 07982 721496. Rumba and Tango on Sundays in February @ the Community Centre. Beginners @ 6; Improvers @ 7; Practice @ 8; Intermediates @ 9. £5 per class or £15 for a 4 week course. For further information contact Tony on 020-85422977. Every Tuesday from 9.15 p.m. to 10.30 p.m. and every Thursday from 8.30 p.m. to 9.45 p.m.
Beginners 7.30 p.m. to 9 p.m.; Intermediates 8 to 9.30 p.m. Every Wednesday at the community centre. Mitcham and Morden MP Siobhan McDonagh has arranged two visits to the Houses of Parliament, which are open to all ages. The first is on Monday 21st, leaving from Colliers Wood Tube Station at 10 a.m. to arrive at Parliament between 10.30 a.m. and 11 a.m., and will be lead by Tony - please call him on 020-85422977 or 07941 488934 to register. The second is on 24th, leaving on the Tube at 6 p.m. to arrive between 6.30 and 7 p.m., and will be lead by Keith - please register by email or on 07982 721496. Each visit will take a couple of hours.